This whole last cycle has just been fascinating to me. Really. It was just so darn neat to ovulate and do my LP BBTs, and then PMS... but let's not forget AF here. Just to recap, I officially consider this my 3rd ovulation ever and the two times it happened before weren't normal cycles anyhow. If you don't count the meds, this really was my first *normal* cycle. So things being as they are, I have never had a normal period... till now. So, I am learning all kinds of stuff lately. For instance, what a Heavy Flow looks like. Seriously, never had one before. In fact, I was in the tampon aisle a while ago and noticed a different color coding on a package of my tampon brand (Tampax for the record... I don't even have heavy periods and the pathetic Playtex tampons still leak). The coloring was orange. I thought they had a new product. No those were the Super Plus tampons. I had completely forgotten they made such a thing... I'm sure I've seen them before at my mom's or aunt's house or something. I also learned that when you have a normal period, you should probably change your tampon more than twice during the day. Almost had to learn that one the hard way. If I'd had a Playtex in, I would of had to gone home to change my pants. Heck, I'll probably even have to wear a tampon to bed tonight (not normally required for me). I listened to my friends tell me for years that I was so lucky to not have my period and then when I got on the pill, I was so lucky cause my periods were so light. I told them back then that I wasn't lucky and probably would be able to have kids, and dammit, I hate being right sometimes. To all my friends that have done nothing but complain about their periods since the first day they had one, trust me, you are the lucky ones. This isn't that bad. 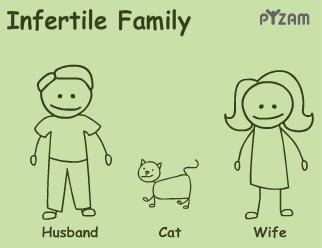 Infertility is. I have stealth flow and no matter what I do it leaks somewhere. I try to only wear dark colors. Blech. I only buy overnight pads. I've had the issues with playtex too. Any tampons for that matter. I'm one of the lucky ones who always has horrible bleeding with periods though. I've also noticed, for me, that the first period after clomid is always heavier and more cramps. I know what you mean. I had very light flows up until the meds made me ovulate. It still shocks me sometimes to see how much blood there is now when AF starts after a medicated cycle. I was just complaining to my friend about how since the miscarriage, I have stocked up on eleven million different kinds of pads and pantyliners. I have a whole shelf devoted to them. I should take a picture of my stash and post it on my blog. They tell you not to use tampons for a miscarriage, so I've been just using up all the pads I bought back then. I like the new always infinity overnights. Haven't leaked through one yet. I agree, I'd rather have put up with years and years of heavy AF and cramps that be stuck with infertility. Sometimes I wonder now if the reason my periods were so heavy and painful is that I had cysts growing and bursting. I used to throw up and have the runs and sometimes faint,then pray to die on a monthly basis. It was awful I would lose two days of my life every time. But when I would tell my gyno my period was painful they would give me that "stop whining" look. It did prepare me for the hsg, since it hurt way less than my period. Ugh - no fun on the heavy cycle. I never know what to anticipate with my irregularity, so the inside of my purse looks like an entire lady aisle's worth of products! Funny post. I've kind of gone the other way since med'ing up. I use to have "normal" flows and now they've become super light!